1,000 students and 70 teachers at the Edgewood City Schools, Trenton, OH are using Acer’s Iconia A200 Android tablets for their tablet education program. With 25% of consumers choosing tablets, and with that number rising daily, it’s not surprising schools are looking at the Android route, too. The percentages of Android to Apple iPads used are amazingly close, as well, according to a Pew Research Project. It’s about 48% Android to 52% iPad. 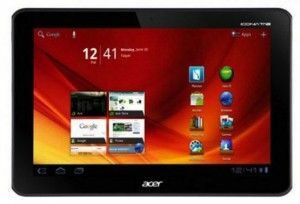 Those percentages include all android tablets, including those used mostly as e-readers and consumer devices, like the Kindle Fire. More education companies are looking at tablet solutions, too. Any way you look at it, Android is giving Apple a run for its tablet market space. Many are leaving their iPads by the night stand, or in the bag, and really “working” those Androids more. App quantity has increased at the Android Play Store, where apps can be downloaded, and hopefully the ones of Quality will rise to the top, especially for education. And unlike most Windows options, to date, Android offers a less expensive solution in a very depressed academic budget time. I usually don’t like Webinars. To be blunt, staying awake and listening in a PowerPoint Webinar is, in most cases, a difficult task. Recently I leaped into the exception, a tech best practice Webinar that made my day—and believe me, there was no way I’d fall asleep or click out. Robin Phares, Tech Integration Specialist, and Kathy Korty, Curriculum & Tech Specialist for the Edgewood City Schools, Trenton, OH not only shared how they were launching an android-based digital learning program, but also gave specifics of what they were using, the work that needed to be done, as well as how they were dealing with the obstacles faced. In my opinion, they’ve created a strong foundation in a very short time, and without the usual year or two of educator preparation for a technology program. They are ahead of most plans in just a few months. They are doing a lot right. Phares and Korty began cheerleading their new digital devices and use long before they arrived and were placed in user hands. They shared that beginning a program like this from scratch had them burning the midnight oils, as well as worrying and working as a team constantly. As they talked, they seemed to have one voice—and one purpose—to change the way teachers taught and students learned in all classrooms, and at home, too. Two things Phares and Korty found important from the start was for teachers to know how to use the voice recorder app, and Google Education docs word processing and online collaboration. Apps they thought important were Evernote for sharing content in online digital folders, and Socrative, an Internet response and assessment software for class polling and short answers. Fortunately, teachers helped by sharing their favorite apps, too, which added to the list. Teachers are using Pearson’s Open Class on the Acer Androids as well. While most educators joined the team, Phares and Korty had a few who were reluctant—their “rocks” as they put it. I shared with them that those “rocks” would soften, especially when parents began to talk about the wonderful things teachers were doing with those tablets. “Why isn’t my son/daughter doing what they’re doing in other those other classes?” is a very appropriate question at a parent teacher conference, as well as for a school administrator to answer. It tends to offer a bit of incentive for those educator stragglers as well. More encouragement can be found in the Edgewood City School District Goals and Strategies for 2012-2015: “Utilize technology that supports the research-based instructional strategies or expectations by the common core standards, the goals from the state of Ohio, and the school district (i.e., interactive whiteboard technology, use of clickers, online instruction platforms, online programs and other technology identified to engage learners.” And because of the tablets, they are also moving toward paperless, and away from textbooks. Phares and Korty found they needed to offer Professional Development. Their professional development included a 10 question assessment followed by a final presentation. Teachers also enrolled in Edge Tech Academy, where they earned college credit for taking professional development courses. Students control their learning through collaboration and connect to real world learning. They use Google docs for writing and editing. Phares and Korty discovered that teachers were acting more like kids, and kids were acting more like adults. Each engaged and enjoying the new technology. They were moving toward their goal of technology as seamless and ubiquitous. Phares and Korty have not had any difficulties with students using the new tablets inappropriately, as they are covered under the district’s acceptable use policy, and parents have been a part of that—from the beginning. I recommended to them that adding an ethical use policy would be beneficial as well. That would get library media, guidance, and other staff involved in proper use of technology, and bring in a much needed digital citizenship piece often times overlooked in new technology education programs. Ken Royal is a teacher/education and education technology blogger/reporter, video interviewer, podcaster, education event news commentator with 34 years of classroom/school and instructional technology experience. His teaching accomplishments include: 4-time district teacher of the year, Connecticut Middle School Teacher of the Year, and Bill and Melinda Gates award for Technology School of Excellence. Read more of Ken’s work at Royal Reports.